Gemini February 2016 Horoscope foretells that career and financial issues are more significant during February 2016 for the Twins. There will be outstanding development in attaining your objectives in life this month. Gemini, there is a clear change in your attitude from compromise and adaptability to confidence and free will this month as the planets are moving from the West to East in your horoscope. The change will happen gradually and will be complete by 25th February. You can take independent actions to guide your personal goals and are not dependent on others to attain your targets. Gemini, remember, your way is the right way. During this month, you should focus on enhancing your professional skills and you may travel overseas to achieve your goals. The 2016 February monthly forecasts for Gemini birthdays suggest that you will be highly motivated in your career and business. You will search for stimulating prospects during February 2016 and you have planetary positions that support your endeavors. Travel abroad is possible to further your career objectives. Geminis in educational field such as teachers and students will excel in their areas and will be financially and professionally rewarded. If you are looking for a change in job, you will be presented with many chances during the month. Money flow will be excellent during the month for the Gemini assisted by your powerful financial intuition. There will be unexpected monetary bonuses and your spouse will play an important role in your financial growth. Eclipses may force you to make temporary changes during February 2016. The love forecasts for February 2016 suggest that single Gemini people should visualize about the future of love and relationships. You have to wait for the opportune moment to get into love relations. If you are already in a relationship, be prepared to face challenges in love after 19th. Dating can occur in professional environment or in physical fitness centers. Family members of the Twins will progress in their professions in February 2016. The home becomes more of an office with all the members engaged in work related activities. Spirituality will be another binding factor for the family members. 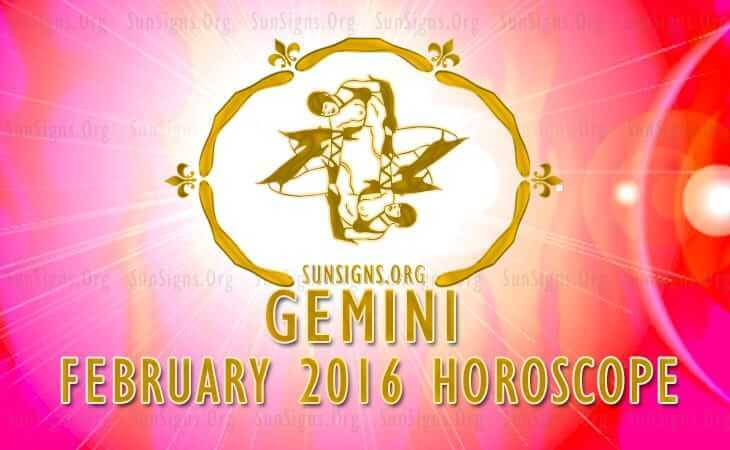 The horoscope 2016 warns that health of Gemini will become fragile after 19th due to professional stress. You should concentrate only on major projects and try to relax while working. Surya Namaskar and yoga can give you immediate relief. To conclude, the 2016 February Gemini horoscope forecasts a month of travel and hectic work on the career front.